We opted for a late start on Sunday 3rd February as we were not allowed to enter our holiday accommodation until 3.30 pm. For a change, the day was overcast and it was not long before regular rain squalls became our companion on the four hour drive north. Even with the inclement weather, our first view of Tapuaetahi from the private gravel access road was jaw dropping. Golden sandy beach, several inshore reefs (obvious as they were being buffeted by heavy ocean swells) and enough rocky areas to have the boys salivating in anticipation. It took us a couple of hours to unpack and settle into the homely, spacious bach. I opted to go fishing before dinner and reconnoitre the main beach area while the boys rock hopped. Remarkably, despite the onshore swell, the conditions were relatively benign on the main beach and this was to become a regular feature during our stay. Essentially the numerous reefs blunted the fury of the ocean so that the main beach never got waves which reached much higher than the hip. The beach was however awash with masses of seaweed ripped from the reefs by the storm surges and then deposited inshore by the surging tide. I started fishing at 6.15 pm using my 8’ spinning rod armed with a Binsky blade. The wind was from the S and it was still gusting 15 knots. Low tide was around 7.30 - 8.00 pm so I was fishing the last of the ebb flow. It was a promising start as I caught four kahawai, largest two around 12 - 14", casting straight out from beach in 45 minutes. My retrieve was reasonably fast and each fish hit close in, just behind breaker line. The suspended weed was an issue and had to be removed from virtually every cast. The weather the next morning was awful. A strong SW wind gusting 20 knots buffeted the beach and rain squalls swept across the bay with metronomic regularity. The sea was confused and murky from the action of the thigh high breakers. Even more seaweed was being dumped in the littoral zone. High tide was around 2.30 pm. There was a break in the weather between 2.00 pm and 3.00 pm so I headed out to take my tackle for a spin, togged up in my wet weather gear. The kite surfers on the beach and in the lagoon were having a ball but the fish failed to materialise. I did notice some decent kahawai leaving the lagoon and postulated that it would be too shallow to support large fish about two hours after high tide. Hamish fished between 4.00 and 5.00 pm and hooked two kahawai from the rocks at the lagoon entrance in quick succession, both lost as they took to the air. This supported my hypothesis that the bigger fish only entered the lagoon around two hours either side of high tide and then exited to sit in the rip and ambush smaller fish forced out as the tide sucked the life force from the lagoon. Thankfully the stormy weather ran out of puff during the night and the day dawned clear, sunny and still. The setting was idyllic. Low tide was around 9.30 am so I gobbled down breakfast and headed out to the main beach to fish the last couple of hours of the ebb tide. I retrieved the Binsky blade continuously at speed for the entire session as it had worked well on the first day. No touches, even in the area where the estuary emptied into the sea. During the day, I thought about my impetuous approach earlier and opted to vary my retrieve for the evening session. During the day the wind spun around to the S (directly offshore) flattened the sea and aided casting. I set out after dinner to fish the low tide over dusk, again using a Binsky blade. I started by reverting to a slower Rip, pause, Rip (jigging) retrieve and within a few casts was hooked up on a 12” kahawai. Another mirror image hit the lure as I neared the area where the estuary drained into the bay. Two casts later and the blade was absolutely spanked by a much larger fish just behind the second onshore swell line. Line streamed off the reel against a heavily set drag at an alarming rate as the fish set sail for deeper water. It then started to jump which is always a problem with a huge amount of line out. Kahawai - and a good one at that. It struggled to get its body completely out of the water. There was no way that it wanted to come closer to the beach and every time I gained line by walking it back it peeled off another 50 metre charge along the beach. Eventually it weakened and allowed itself to be beached. I was ecstatic and let out a whoop of delight. The late afternoon swimmers spun their heads like they were taking part in a synchronised routine at the Olympics. I glanced at my watch and realised that I’d been hooked up for 15 minutes. The kahawai weighed a stonking 5lb and was my best on a lure for 12 months. The boys headed out during the day in the dinghy with a friend and managed to catch a couple of keeper snapper as well as attach themselves to a 55 cm kingfish. Tim had a another couple on, judging by the line smoking runs, but dropped them both early in the fight. Later, instead of fishing from the shore, we opted to drag net the main beach to try and secure a feed of flounder. The first drag at 8.00 pm from mid beach towards estuary mouth yielded two flounder, one undersized. Next drag another flounder, a yellow eyed mullet and a crab. One blank drag then a drag which yielded 12 parore and a grey mullet. After dark, two drags yielded snapper and one more flounder. What was interesting was how the fish species captured changed as darkness descended. The parore school was obviously driven out of the estuary by the ebb tide and were holding in the margins awaiting the incoming tide. The snapper obviously were moving into the shallows to feed once it was dark. By now low tide was around lunch time so my beach fishing sessions were ideally going to be focussed on the early – mid morning. The day was again clear and sunny with SE wind gusting 10 - 15 knots. Unfortunately we had to go into Keri Keri in the morning to collect one of Tim’s pals so I ended up fishing the main beach and explored estuary between 3.00 - 4.00 pm. The fishing was slow with only two undersized kahawai, both foul hooked, falling victim to the ripped Binsky. I returned at 8.00 pm to fish dusk hour. Again no touches on the Binsky between mid-section of the beach and the estuary mouth. In despair I fitted on ¼ oz. jig head and 3" Atomic shad (Pepper). Five casts in and the tail was donated to a small snapper, judging by the pock marks on the remaining lure. The trick with the soft plastic was to employ an Über slow twitching retrieve. Time for a change in tactics. The day dawned clear and still. The wind wheezing asthmatically at 5 knots from the S. High tide was at 7.30 am and conditions were ideal for a post breakfast fly fishing session. I grabbed my Hardy #9 weight Sirrus rod, attached the Lamson Speedster fly reel (aka “The Beast”) and headed for the estuary mouth bathed in sunshine. I started fishing with a WF 9F floating fly line and an ever reliable orange Clouser as the tide reached its incoming apex. It was dead and I had no touches between 3/4 away along the beach to near the estuary mouth. Most disappointing. I was casting about 80 – 85’ out and the fly was landing just behind the second wave set which seemed perfect. I retraced steps back towards the bach and changed fly to the smelt pattern (holograph tube coated in epoxy with the flashabou tail) that I tied immediately before leaving Auckland. As the tide started to flow steadily out of the estuary I began to notice small baitfish moving erratically in the margins as if they were being harassed by a predator. I covered the nervous water with the fly, gave a couple of fast strips and all hell broke loose. The rod buckled down hard as something heavy engaged afterburners and set sail for Argentina. The Lamson snarled in fury as line was ripped from it at an alarming rate. Within seconds I was 50 metres into the backing and the fish was still on the charge. Then it took to the air, or should I say, tried to take to the air. The kahawai was so big that it could only launch its head and shoulders skywards before awkwardly crashing down in an explosion of spray. Every time it went aerial, which was a fair few, it shook it’s head in blind fury trying hard to shake the hook free. I applied heavy side strain and was able to stop its South American charge only for it to barrel along parallel to the beach. At the mid-point of the fight I estimate that there was over 100 metres of line in the water. Eventually by walking back and applying side strain I was able to get the fly line on the reel but not sooner had I got a wrap than it took off again stripping me well into the backing. The water was crystal clear and the fish was clearly visible every time it was drawn into the shallow water. You could actually see it tensing its huge frame before charging off. Awesome. Ten minutes into the fight Sandy’s relation, Mitch, arrived and commented that watching the kahawai perform was just like watching sharks in the surf in a National Geographic documentary. Twenty minutes into the battle and the kahawai was clearly spent from its exertions and was unable to stop me from dragging it onto the sand with wave assistance. High fives and whoops all round. It pulled the scales down to 6.5 lb., my largest fly caught kahawai to date. It scraped the sand when held by my side. I was dead chuffed. Both of my holiday outcomes met within six days of arriving! By now I was surrounded by locals. They were astounded to see that I’d caught the kahawai on a fly. One elderly English gentlemen, a fervent fly fisherman, was inspired. “This is the first kahawai I’ve seen caught on a fly in 27 years at this beach. I’ll be getting my fly rod sent up from Auckland pronto!”. My hypothesis that the XOS kahawai start to hunt the margins around 1 - 2 hours after high when small fish flushed out of estuary seemed to be correct. , an undersized snapper and a pig fish. I couldn’t help wishing I was elsewhere and was not concentrating hard enough. Hamish changed to a Zoom white ice after an hour or so and immediately hooked a kingfish. Line poured off the reel for a minute or so and then everything went slack. The kingfish obviously had finished its daily calisthenics and decided to spit the hook. Bugger. Tim and Sandy fished from the dinghy in the first shift. 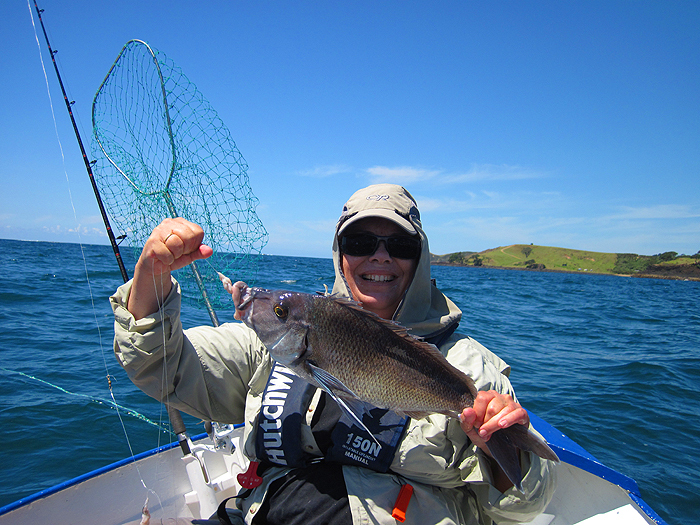 Sandy hooked, landed and released a 60 cm kingfish after a spirited tussle. Her holiday wish complete. The day once again dawned clear, still and sunny. A complimentary zephyr from the S aided casting. High tide was just before 9.00 am. 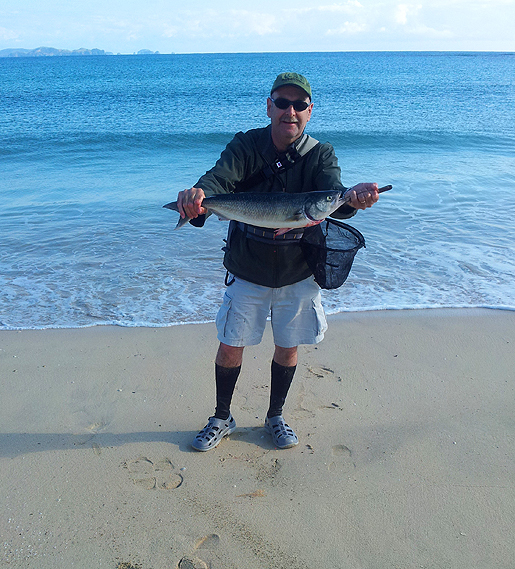 I fished from 8.30 - 10.00 am on the main beach with my fly rod. Again when the tide changed the piscatorial activity increased. I hooked three small kahawai early in the session but the highlight was seeing another XOS kahawai cruising the breakers. I fired off four casts in front of it. The first three were ignored but it shaped to charge the fourth and switched on the rear turbine. Just before it inhaled the fly a tiny (two finger lengths) kahawai shot in and took the fly from out of its mouth. I was furious as by the time I’d removed the miniscule kahawai the leviathan was long gone. I did manage to catch a larger 1.5 lb. kahawai around 9.50 am but it was small consolation. Sting rays with wing spans the size of bath towels were heading past all morning, at pace. I saw several other smaller kahawai working the breakers during the session. Tim and Sandy again fished from the dinghy in the first shift. Sandy hooked and landed a 5lb. porae after a short intense battle. Personal best for this species and largest keeper fish for her to date on holiday. 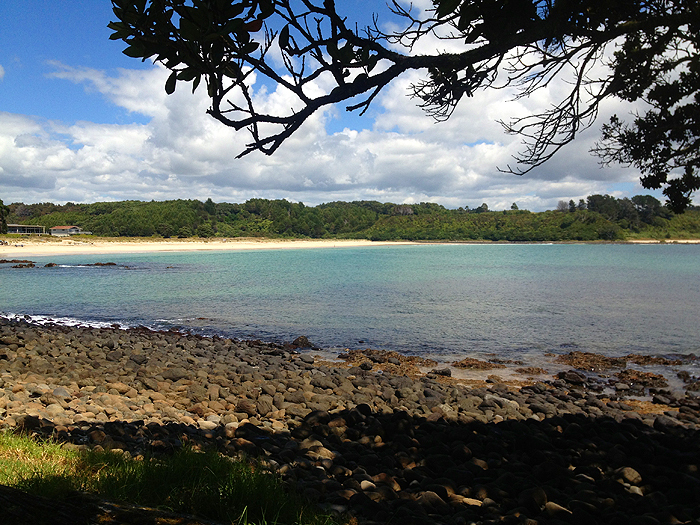 Another beautiful day on the main beach at Tapuaetahi. Clear and sunny with faint supporting breeze from S. I started fishing at 10.15am with the reliable epoxy holographic tube smelt fly. No touches in 30 minutes. Changed to holographic Clouser for same result. Kahawai were visible in the surf from 10.45 am, including some XOS models which would have been close to 8 – 10lb. Seeing them systematically work the breaker line from right to left in front of me was special. Unfortunately the wind spun around to the N at 10.30 and increased in strength which made it very difficult to cast far enough to tempt those fish I could see moving past. Incredibly frustrating but amazing fishing. One imagines this is on par with sight fishing for bonefish on golden sand in the tropics. Switched back to epoxy holographic without success. Looks like my hypothesis about when fish are active has been proven correct. Hamish and Tim went out in the dinghy for a soft bait versus cut bait competition. Four keeper snapper. Three around 32 cm to Tim and one thumper of 7lb to Hamish which was caught on Gulp! Scented soft bait. Given that his fish was bigger than the weight of the three smaller fish combined, Hamish is confirmed as competition winner by the panel of independent adjudicators and he had ticked off his holiday wish. The weather this morning was not conducive to fly fishing on the main beach. Even though it was again clear and sunny, the steady 10 knot wind puffing from NE restricted fly casting distance so I opted to spin fish. Started at 11.00 am. Initially I used Clown Yo-Zuri 3D vibe minnow and caught a small kahawai within first 20 minutes and nothing thereafter. I switched to the Binsky blade for last 25 minutes. Ended session at 12.05 pm. Frustrated. Once again I saw some larger kahawai hunting in margins at 11.15 am but could not hook up. They looked like silver ghosts as they drifted nonchalantly in amongst the breakers. On one occasion three fish surfed an incoming wave and I could almost have touched them with my rod tip. The fly I dropped in amongst them was lost in the swirling sand as the wave broke and was missed by all. It was very difficult to see the kahawai later in session as the wind driven swell made the littoral zone murky. As on most days, Sandy, Tim and Hamish fished from the dinghy. Two legal snapper and a trevally but all returned. Hard day all round. Hamish went rock hopping with a Binsky blade in mid-afternoon. Hooked a large kingfish on his first cast. It hit top gear within seconds and set its GPS on auto pilot for South America. He tried to apply extra drag pressure and straightened the trebles. The air was apparently blue for 20 minutes! Another ditto day at Tapuaetahi. High tide at 11.20 am. Clear and sunny. Wind was initially from S so I chose my fly rod. Unfortunately 15 minutes after I started fishing at 11.40 am it swung around to NE, gusting 10 knots. On top of this misfortune, I had also left my Vedavoo sling pack at home so I only had one fly, the epoxy holographic smelt, for the entire session and no trace nylon. I re-tied the fly every 20 minutes to ensure that it stayed attached. The damned wind stirred up the margins once it swung to the NE so it quickly became impossible to spot fish. Compounding this, I found casting into head wind difficult and the fly line tangled regularly. (I cleaned the line after the session and it worked better after this). During this outing I struggled to get the fly over second break line which is where fish were holding. No touches. Wind died for last 20 minutes. Perfect but fishing blind due to the suspended sand emulsion. Finished at 1.20 pm. In the afternoon we checked out Boulder Bay. It was a decent walk as the boulders were the size of over inflated beach balls. Walking over them for about 1 kilometre is best described as “character building”. The boys saw three crayfish snorkelling so raced off once we got home to set a pot at 7.15 pm. Caught two 1.5 – 2 lb. kahawai trolling a mullet Rapala CD7 en route. The day almost predictably dawned sunny and the sky was pock marked with white cloud resembling cotton balls. High tide at noon or should this be Tide at “High Noon”? Fished from 11.40 to 1.00 pm. The wind gusting 10 - 15 knots from SW predominantly, although shifted between S and N for brief periods. Given the conditions fly fishing was not an option. For a change I started with a 2" PowerBait soft plastic on a 1/4 oz. ball jig head. Unfortunately the only action was from a fingerling kahawai nibbling the tail of the soft bait during the retrieve. Excellent water clarity. I changed to small Yo-Zuri L-minnow (Rainbow Trout) and hooked a 14" kahawai within 30 casts. Saw another 3 - 4 lb. kahawai ghosting across the golden sands close to shore (aka bonefish). Cast near it twice for one follow. Probably would have nailed it on a fly. Truly special to be sight fishing for kahawai within two rods lengths from the shore. Had to pinch myself to prove it was not a dream! Hamish and Tim had a re-match of the bait versus soft bait contest in the morning. 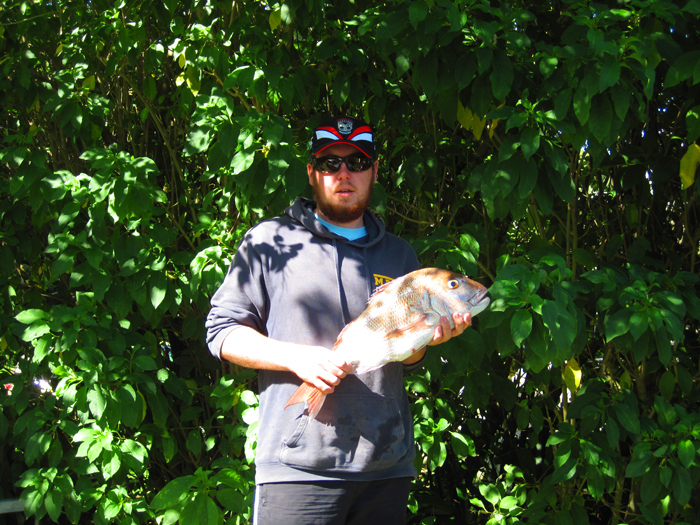 Hamish caught a kahawai (3 lb.) en route to retrieve the empty crayfish pot and a 4 lb. snapper on a Zoom White Ice. Nothing of mention caught on bait. Soft plastic 2 – foetid bait 0. Adjudicators pronounce the contest an “arse whupping”. Tim and Hamish went back to Boulder Bay in the afternoon to snorkel for crayfish. The mood as they left was one of gritted teeth determination. A glint in their eyes which indicated they were not going to be denied. Returned home with a nice crayfish caught just before they gave up by Tim. Tim finally gets the monkey off his back and achieves his holiday wish. Time to break out the champagne. What a place and what a holiday. They do not come any better than this. How about that? my little comments about Brazil will become clear when I write up my trip later. Well done the Bulmers! Hamish and his big snapper.